Enjoy this awesome combination of spicy and creamy loaded nachos that you can whip up in just 20 minutes. 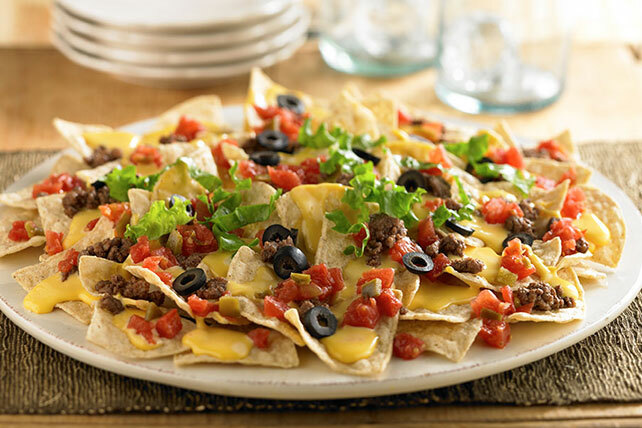 VELVEETA® Fast 'n Tasty Loaded Nachos feature extra-lean ground beef, diced tomatoes, black olives and green chilies. Microwave VELVEETA in small microwaveable bowl on HIGH 1 min. or until completely melted, stirring after 30 sec. Place chips on large platter; top with VELVEETA, meat and remaining ingredients.